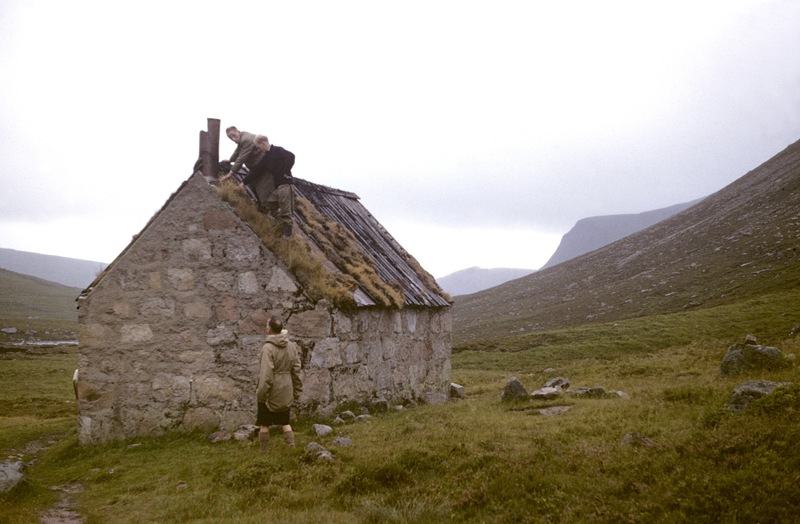 Some images from the original Corrour Bothy work party appeared recently on Facebook, courtesy of Alasdair Ewan, grandson of Bill Ewen, who took them in 1950, when the Cairngorm Club rescued the building from collapse. I wrote about Bill Ewen and his active role during this period in the Cairngorms some time ago, and it’s worth reading about his activities. I contacted Alasdair who kindly shared some more images from the 1950 renovation date and other occasions. I’ll write more about the other times later, but for now let’s have a look at that pivotal time in Corrour Bothy’s history. Since being abandoned by the estate not long after the First World War, Corrour had been used increasingly by the growing number of walkers and climbers. For many it was just an abandoned building rather than a resource to be cherished for the future, and too many thought nothing of burning first the furniture and then, when that was gone, the flooring and wood lining. 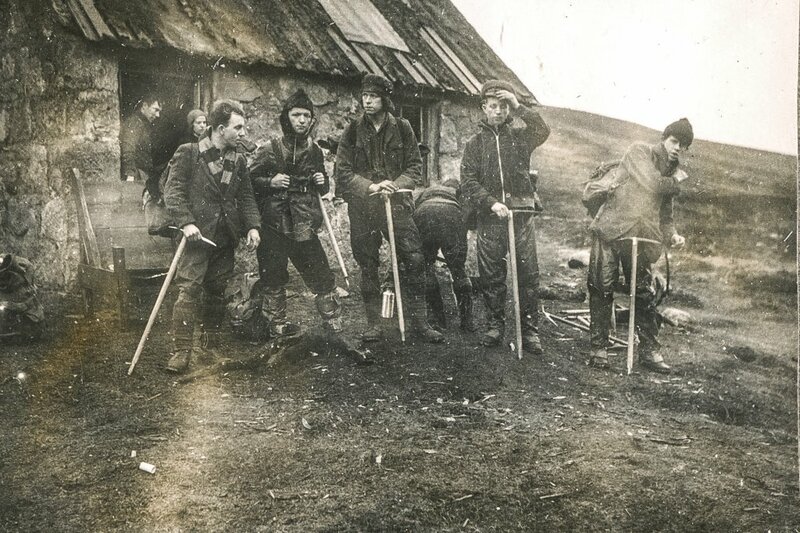 A rough-looking crew at Corrour, date unknown but prior to 1950. Pic courtesy of Scottish Mountain Heritage Collection. A slightly more salubrious-looking gang (but who knows), again prior to 1950. The tall man on the right may be Cairngorms climbing legend Bill Brooker. 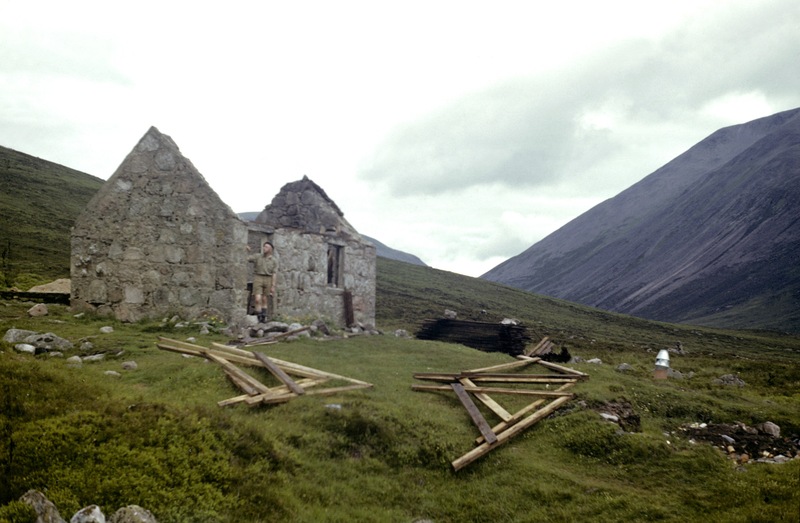 Pic from Scottish Mountain Heritage Collection. It was already being described as ruinous in the 1930s, but by the late ’40s matters were getting really serious. The roof was on the verge of complete collapse and the weakened walls were likely to follow soon after. 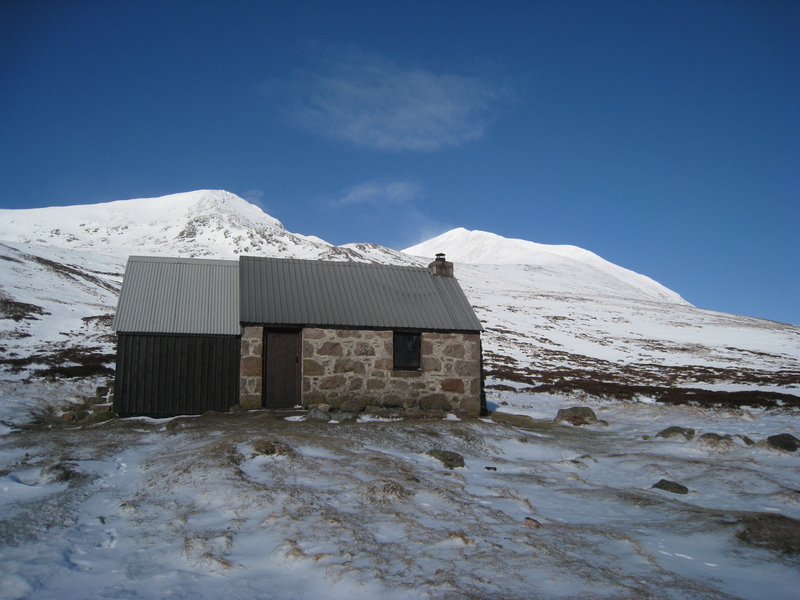 The Cairngorm Club, particularly active in that era, managed in 1949 to persuade the estate to allow them to renovate the building and maintain it as an open shelter, although still in estate ownership. 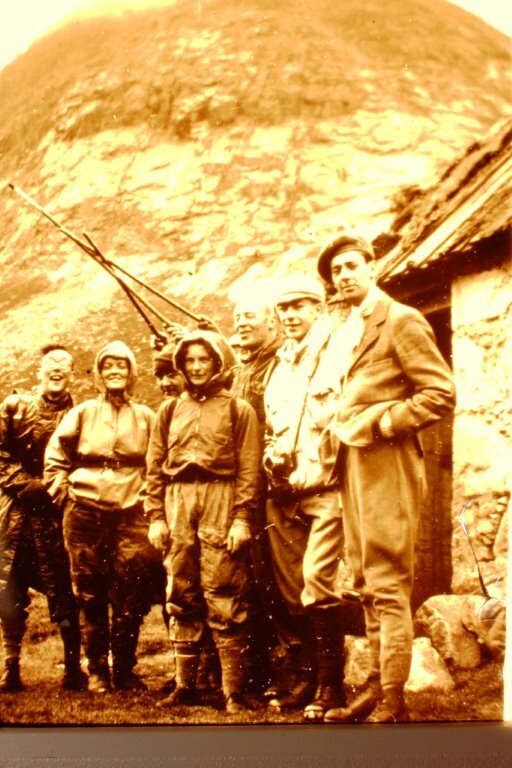 Bill Ewen convened the committee charged with the renovation, which took place over the summer of 1950 and is entertainingly recorded in the Cairngorm Club Journal Vol XVI No 87 by George Taylor, another stalwart of the CC’s construction activities. Now enjoy these historic pictures of the reconstruction, taken by Bill Ewen. A site inspection at Corrour. It’s not hard to see the sorry state the roof was in. 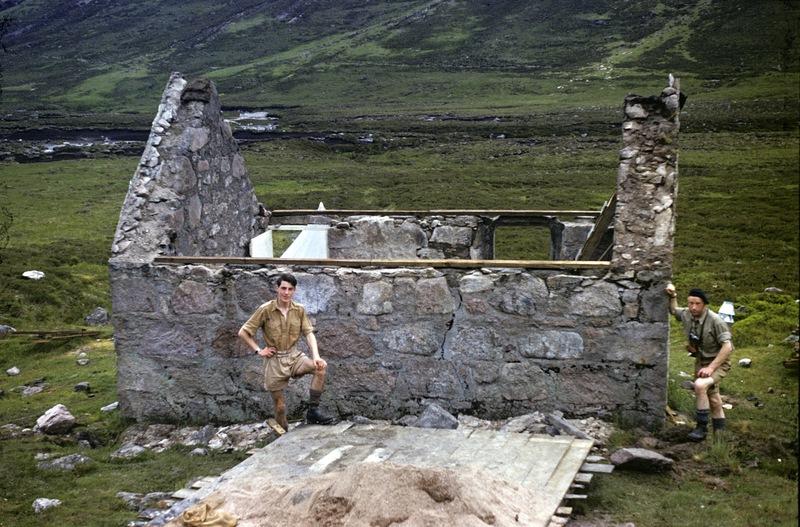 Anyone who’s ever helped strip back a bothy for a renovation will know this terrifying stage. The roof is almost complete. But note the buttress which now holds up the north gable is not started yet. This work party had a way to go still. Note the home-made ladder: similar improvisation was also used during the 2006-7 renovation. And how it is now. The wooden extension was added over 2006-7 to house a toilet. This was stripped out just last week preparatory to an improved toilet being built. Photo by Neil Reid. 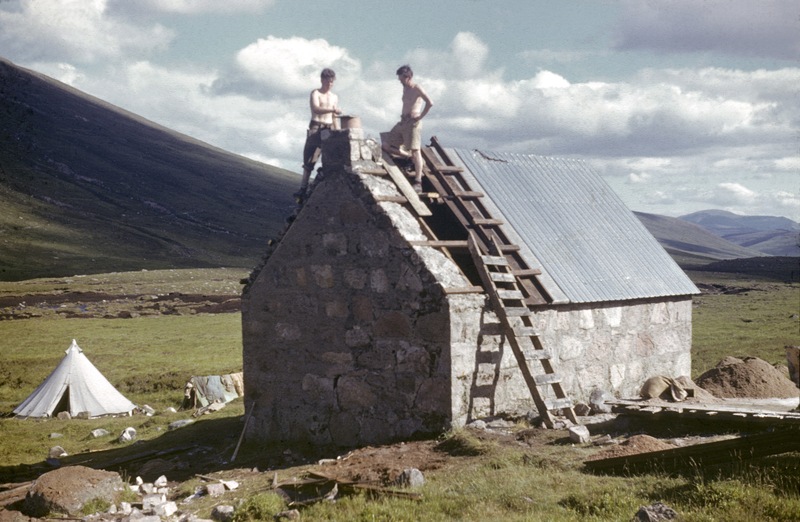 This entry was posted in Bothies, History, People and tagged Bill ewen, Cairngorm Club, Corrour Bothy. Bookmark the permalink. As ever fascinating and interesting stuff about Cairngorm issues that too many people take for granted. I’m always amazed at the number of people I meet who use the MBA bothies but have never considered becoming members of the MBA? Very impressed with these pictures . Nice light weight tent in one of the pictures !! Aye, probably weighed even more than the three man Vango Force Ten I kept lugging in to the 2006-7 renovation. 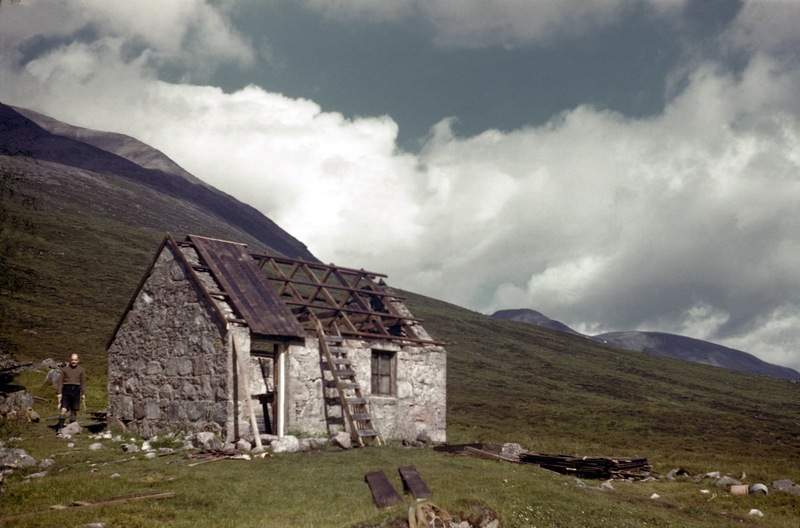 An excellent piece Neil, good to be reminded that Corrour’s bothy life extends over a lifetime, long may it continue. Another historical article to whet the appetite of days gone by. Can’t wait to read more. Keep up the good work Neil. I also wondered who had carried in the Bell Tent. Maybe it came in by the helicopter. No helicopter then Sinbad. Alasdair checked the details again and the helicopter photo was for the Corrour Bridge, which came later. I’ll have a post about that too when I get a chance. I did notice , on one of your fab pictures…there was a bench outside for weary travellers !